Earlsfield (formerly Garratt Green; var. Garret, Garat &c) – in the London Borough of Wandsworth – is a somewhat nondescript inner south-London suburb. It is dissected by the River Wandle, a tributary of the River Thames. In past times the area was open farmland and with no settlements other than the hamlet of Garratt Green, home to a large water mill. Garratt Lane, running parallel with the Wandle for some distance, is the main thoroughfare of Earlsfield; its name keeps alive a memory of former times. Sketch map of south-west London showing the location of Earlsfield. With the coming of the railways in the 1880s the construction of a railway station required the purchase and demolition of a large house called Earlsfield. One of the conditions of its sale was that the station should be named after the house, and so the area has been known ever since. From the mid eighteenth century until the 1820s Garratt Green was widely known for the rumbustious carnival atmosphere that accompanied the election of a ‘mayor’ to oversee the management of the common land. These elections were timed to coincide with national elections, but outgrew their original purpose to become something of rallying point for the un-enfranchised classes to have a day out and mock the political system that denied them a vote. Reports talk of tens of thousands attending. The scene of the election was the Leather Bottle pub, which still stands on Garratt Lane. The elections were immortalised in a popular drama called ‘The Mayor of Garratt’ (1763), written by the actor-dranatist and impresario Samuel Foote (1720-77) who had witnessed the 1761 election. Ephemera of the Garrett elections. The church of St John the Divine on Garratt Lane was established in 1903 as the Bendon Valley Mission Church, a mission church of St Andrew’s, Garratt Lane. In the 1920s plans were drawn up to replace the mission building with something altogether more grand, designed by F H. Greenaway and J.E. 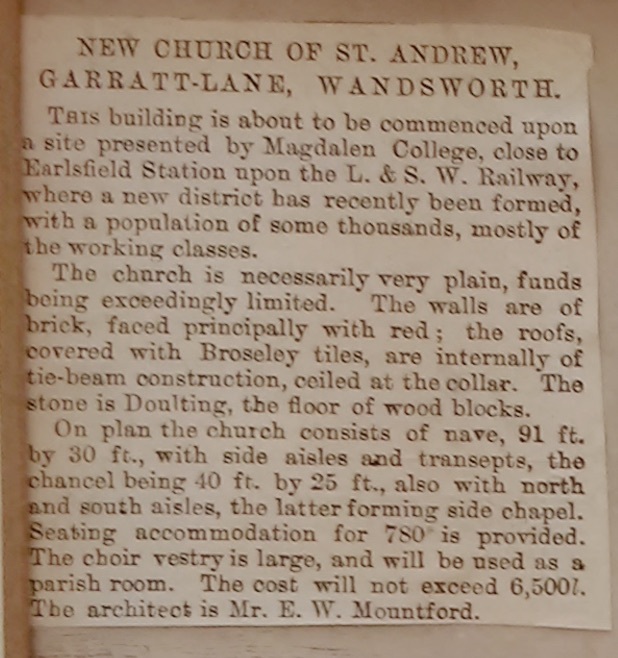 Newberry, and dedicated to St John the Divine, ‘on a corner site at the junction of Garratt Lane and Bendon Valley’ (The Building News, 29 October 1920), but these plans were never carried out. Instead we have the rather modest building that dates from 1925 by the architect Arthur Young, 1853-1924, supervised after his death by his business partner Allan Douglas Reid, 1898-1977. (C20 Society Churches Database). The font came from St George Battersea (Southwark Diocesan Records [SDR]: DS/F/1936/008). St John the Divine became a parish in its own right in 1938 (SDR: DS/OC/1938/001). According to an advertisement for a parish organist in The Musical Times of 1943, the organ at that time was a ‘S Cecilia Organ’. I am guessing that this refers to the economical production-line instruments made in the early decades of the twentieth century by the firm of Henry Jones in Finsbury Park, north London. In 1974, according to the National Pipe Organ Register (NPOR), the church had a two-manual instrument but gives no maker’s name. Was this the St Cecilia organ, an enlargement of it, or something altogether different? Organ builder’s announcement about the organ in St John the Divine Earlsfield, in ‘The Musical Times’ (vol. 117, no.1605, November 1976. NPOR notes that in 1976 a new two-manual and pedal instrument was installed by Percy Daniel and Co. Lrd. of Taunton (Somerset). This instrument was mentioned by name in several quarter page adverts placed by the company in The Musical Times during 1976 and 1977. Tne organ is sited at the south-west corner of the church, and when I played it earlier this year it was in excellent condition with no extraneous mechanical or wind noise, and was unexpectedly satisfying to play, being well-suited to accompanying the congregation in this small church, and an ideal ‘no frills’ practice instrument. St Peter’s church (1864) on Kennington Lane in Vauxhall, south London, is a very nice unadulterated example of work by the English architect John Loughborough Pearson (1817–97). What a pleasure to discover it this week. John Loughborough Pearson (1817-97), c.1861. National Portrait Gallery London, with permission. From the late seventeenth century and all through the eighteenth this place was the location of the celebrated New Spring Gardens or Vauxhall Pleasure Gardens, a place of fantasy and fun on the south bank of the Thames for leisured Londoners. By the mid-nineteenth century the gardens were closed and the area was fast becoming a densely populated and semi-industrial working-class suburb with almost none of the gardens remaining, indeed the church is built on the south-west corner of the gardens’ site. The 1794 house next door to St Peter’s church is now the vicarage but it was originally the home of the widow of Jonathan Tyers II, a former owner of the Vauxhall Gardens. St Peter’s church (1864), Vauxhall, south London, seen across what is left of the Vauxhall Pleasure Gardens’ site today, a grassed open space, c.2015. While the outside of this well-maintained church has some nice decorative flourishes here and there, the inside brims with finely wrought design such as the fine carving and decoration on the font and the elaborate carved capitals of the nave, the decoration of the chancel, and the lofty brick vaulting. St Peter’s church, Vauxhall, London; font. The organ (1870) by T.C. Lewis sits at the east end of the south aisle, next to the chancel. It was initially rented from Lewis as a temporary instrument but was eventually purchased outright by the parish in about 1873. It is rather too modest for the building and it is to be regretted that Lewis did not get the chance to provide this fine building with a more substantial permanent instrument. But as with all organs by Lewis the tone is lovely; each stop sounds remarkably fine in its own right, crisp and articulate, and yet is able to blend wonderfully well with its neighbours. Now, after almost 150 years of service the mechanism is rather tired and rackety, and at the time of writing an organ-restoration appeal is underway.